We have made Tiberium economy and unit balance changes. We have made some balance changes to several units. This week, we have some unit balance changes. Read below to see the details on what has changed. We’ve heard feedback that it takes too long in order to earn the required cards to level up a unit, and that by the time a player has finally earned enough cards they have more than enough credits for training. Therefore, we are adjusting crate rewards to give more Rare cards, and many more Epic cards. Common card drop rates are also being adjusted to keep them in sync with the other rarities. In order to balance this increase, we are looking to slightly reduce the amount of Credits one will receive from Rare crates. We will be continuing to make adjustments related to card and credit requirements for leveling up in the near future. We want it to be easier to earn cards, and we want players to be working to earn the required Credits for a bit longer. Don’t worry though, we aren’t just trading card requirements for credits – the net effect of these changes should be that players are able to reach higher levels (especially Rares and Epics) more quickly and more predictably than previously. Below are the details on how Common, Uncommon and Rare Crates have been changed in this update. – The number of Common cards being dropped has increased at player levels 1-14. – The number of Common cards being dropped has slightly reduced at player levels 15-20. – The chance of getting a Rare Card has increased by more than 60% at every player level. – The number of Common cards has slightly reduced at player levels 15-20. – The number of Rare cards increased by more than 60% at every player level. – The chance of getting Epic cards has increased by more than 200% at player levels 3-20. – The number of Common cards being dropped has increased at player levels 1-16. – The number of Common cards being dropped has slightly decreased at player levels 17-20. – The number of Epic cards being dropped and the chance of getting an Epic card has not been changed. We’ve heard your feedback on the current Crate selection in the Store. As you level up, you gain access to more units but you always get the same amount of cards from the Crates. This has been changed to that as your player level increases, Crates will offer an increased amount of Cards and Credits; however, the price will NOT change. 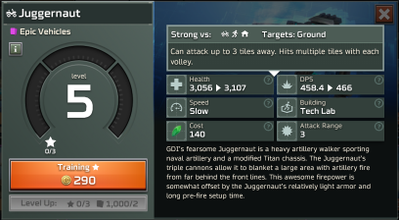 – Made some tweaks to how Titan weapon works. As always, we welcome your feedback and suggestions – you are our partners in making this game the best version of itself. We realize that players have different play styles – some people play a few battles at a time over the course of the day, while some will sit down, focus and play a ton of battles in a row. We want the crate system to be flexible enough to support both play styles. This week, we have some Unit and Commander Ability balance changes. Read below to see the details on what has changed. We released Update 1.0.6 today. This update fixed several crash issues that players have been experiencing. We have made game adjustments aimed at addressing the Epic unit leveling issues as well as re-balancing of several units. The in-game store offered one Common, one Rare, and one Epic unit card each day. These units were randomly selected from GDI or Nod after players reached Level 4. As the faction for each unit was random, a player who battled predominantly as Nod may only have access to GDI units. We are changing how the store functions for players Level 4 and above, so that players will have access to both GDI and Nod units. Each day, the store will offer a total of 6 unit cards: three GDI unit cards (one Common, one Rare and one Epic) and three Nod unit cards (one Common, one Rare and one Epic). Right now, the rate at which Epic units level up is not keeping pace with the rate for Common or Rare units. Players are unable to collect enough Epic Cards, so Epic unit levels are falling behind Common and Rare units. With this update, we are starting to make adjustments and will continue to monitor how Epic units are leveling compared to Commons and Rares. Disruptor beam no longer does damage to friendly units or structures. Disruptor can now fire while moving. Increased rotation speed of Disruptor turret. We are adjusting the Tiberium Economy, slightly dialing back some of the changes from Update 1.0. The unit power difference between levels was tuned too high for units level 5 and above, so we are slightly adjusting that variance. Starting at Level 5, for units within one level of each other, the power difference between maximum trained units has been reduced. There is a new update available for Command & Conquer: Rivals. A small update was released to fix some bugs found in Update 1.0. Friends List: Your friends may not show up on your Friends List (aka your Friends List may be empty). You are still connected to your friends; however, they are not visible in-game. Learn more about these new units, including tips and counters, in our New Unit Showcase! Having only one set deck per faction can be limiting. You need to rework your deck whenever you want to test a new unit or complete a bounty. In this update, we are changing the number of saved decks from one per faction to three saved decks per faction. This will give you flexibility in trying new decks without needing to changing your core deck. We understand that players enjoy the social aspects of games. To make it easier to We are introducing a Friends List, which lets you add people you know from Facebook, Origin or in-game. You’ll be able to see friends’ progress and share match replays via C&C Network. While you can’t directly battle friends yet, this is just the beginning of what we hope to do with your Friends List. Expect more to come in future updates. We’re expanding our social features with the new C&C Network. Consisting of an Activity Feed and C&C TV, this new feature set will keep you connected to your friends, your alliance members and the Rivals Community as a whole. With your new Activity Feed, you can keep up to date on your friends and alliance members achievements while sharing your own milestones. Plus, you can show your appreciation for friends’ hard work by liking the posts that you enjoy most! Your Activity Feed will track the Weekly Bests specifically for you, your friends and your alliance members — displaying Most Games Played, Longest Win Streak, Highest Win Rate (min. 5 games played) and Most Medals Earned. “Weekly Bests” updates in real-time, so you can see your progress as soon as a match ends, and everything resets to zero at the end of the week, giving everyone a fresh chance to have their name and accomplishment featured. C&C TV is a new resource where you can watch full match replays from players at your skill level and replays from the very best players in all of Rivals. Watch replays from players atop the Medals leaderboard to find new decks to play, learn new strategies and incorporate new match tactics. All it takes is introducing one new idea, tactic or unit into your own play for everything to shift for the better. And when things are going well, watch C&C TV just for fun for some of the most entertaining and competitive Rivals matches out there. Filter by sector to find exactly the kinds of games you’re looking for — whether that’s top-tier play with prime meta decks or ways to counter army buildouts more common at your sector level. Full details of the C&C Network can be found here! Before deciding if a unit is Common, Rare, or Epic, we look at a number of different factors including, but not limited to, unique mechanics, utility and hyper-speciality. Most notably, we want to make sure that Epic units represent certain combinations of factors that make them feel like they can have special impact on the battlefield in the hands of a skilled player. When reviewing our current and upcoming units, we wanted to make some changes to make rarity feel more consistent. – The impact of long range units on the battlefield can be devastating when positioned and protected effectively and we wanted the rarity to reflect that. Making Sniper Team Epic also frees up space for a different Rare anti-infantry unit to join the Barracks. – Although the Disrupter is a long range unit and it is much more expensive than the units mentioned above, we want Epic units in the Tech Lab and Temple of Nod to be particularly special. Simply being a long range unit isn’t enough to be considered Epic. Making it a Rare also increases the frequency with which this unit will appear, adding strong late-game anti-infantry capabilities to the Tech Lab. – The Pitbull’s speed and harassment utility make it function similarly to the Nod Attack Bikes, and we want its rarity to reflect that. – Similar to the Pitbull change, the Predator Tank and Scorpion tank are very similar, and both should be Common. – The Kodiak is an awesome unit, but its single unique mechanic of firing upon multiple hexes does not warrant Epic status as we look forward to future Tech Lab Epic units. – The Confessor’s breadth and unique buff to allied infantry make it unique and impactful in a way that warrant its rarity increasing. – Similarly to the GDI Kodiak, the Basilisk is a unique unit, but it does not fit with our plans for future Temple of Nod Epic units. – This is the most dramatic change we are making. Obviously, the Scarabs are a unique unit; they are the only self-destructive unit, and the way they are able to isolate and protect areas of the battlefield make them extremely unique. This warranted increasing their rarity to Epic. With the changes to unit rarity, we want to make sure that we do not disrupt the current combat meta. For the units that are increasing in rarity value, we need to reduce the potential impact that training and leveling these units can have on the meta. Players with the MLRS, Sniper Team, Pitbull, Confessor, and Scarabs have had their card balances compressed. When units are unlocked, we want them to feel like an exciting addition to the existing roster without altering the combat meta. When reviewing the current unlock sequence, we found some units and Commanders that had unintended effects on the meta for that level. Increasing or decreasing the Player Level required to unlock these units should put them in a better place, where they don’t force the meta to change but still are a great addition to your army. The following units had their Player Level decreased. The following units had their Player Level increased with this update. If you own one of the units mentioned below, and its new Player Level requirement is higher than your current Player Level, you will be able to use that unit. You will not accrue any new cards for that until until your Player level is at the new, required level. 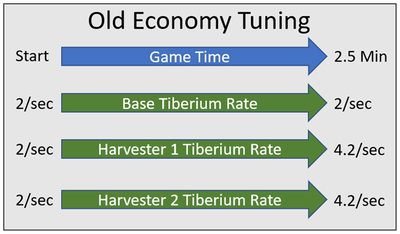 As part of Early Access, we’re testing out some new Tiberium economy tuning. Before breaking down those changes, let’s talk about how the Tiberium economy has worked up until now. The new economy tuning makes some important changes to this scheme. For starters, the base’s tick rate now gradually increases from 2 Tiberium per second to 4 Tiberium per second. The reasoning behind this change is that we feel it’s overly risky to open with an aggressive, zero-Harvester strategy. It should be a risky opener, but right now, if a player fails to destroy an enemy Harvester, it takes a full 30 seconds to save up the 60 Tiberium required to build their first Harvester. Yikes. This is both extremely punishing and not very fun. Increasing the base tick over the course of the battle will make it a bit easier to save up for the first Harvester. This should also allow zero-Harvester players to stay aggressive a bit longer before transitioning into their first Harvester. We are also changing the way the Harvester income rate ramps. 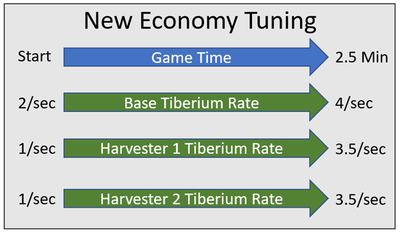 In the new economy tuning, Harvesters at game start generate only 1 tiberium per second (half of the base’s rate). The Harvester’s top rate is lower as well, reaching only 3.5 Tiberium per second by the 150-second mark. Our intention is to make two-Harvester openers a bit riskier. Now, at the very top level of play these greedy openers have fallen out of favor. That said, at lower levels, it’s too easy to build directly (or very nearly so) into two Harvesters. The amount of income a two-Harvester player has in the early game was equal to the amount of income a single-Harvester player has in the extreme late game. There should be more of a ramp for the economy before double-Harvester players really start cranking. Still, we do want two Harvesters to be an interesting and viable opening at all levels of play, so we are slightly increasing the total income a player has when running two Harvesters in the late game. We hope this will strike a better balance between the risk and reward on various openers and economy strategies. We will continue to evaluate and tweak these changes based on your feedback, so definitely let us know what you think. We have adjusted how buildings and units are presented on the in-game commander bar. Previously, the icons for the available buildings were all the same size and centered on the commander bar. When a building was unlocked, the remaining buildings shifted to the left to make room for the units within that building. As more buildings were unlocked, the unit position on the commander bar would shift position. 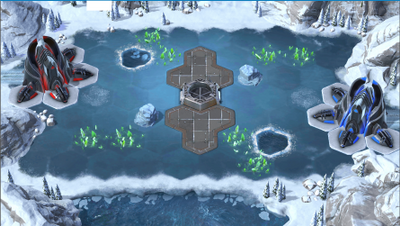 We have decided to simplify the commander bar, so that the position of buildings and units remains stationary throughout the game. The width of each building is dependant on the number of units that unlock with that building. A building that unlocks three units will be wider than a building that unlocks one unit. When a building is unlocked, the unit icons are contained within the same location as the building icon. Unlocking new buildings will no longer cause units or buildings to shift locations. Starting with units at level 5 and above, we have adjusted the amount of power that a unit gains as they level up. The amount of power gained is now flat from level to level, making the power gains consistent as units are leveled up.This structure ensures that the expected relationship between units remains constant regardless of the level. For example, with this change, a level 8 Talon vs. a level 7 Missile Squad will have the same result as a level 10 Talon vs. a level 9 Missile Squad. Bounty tasks are designed to give players daily goals to complete during their matches. While bounty tasks accomplish this goal, we felt that the requirements were often too harsh. In particular, requiring victories under strict conditions often feel punishing. The requirements for many bounties have been adjusted. We believe these changes will make bounties feel less demanding, and we will continue to monitor the system for future updates. Requesting and donating cards within your alliance is an important part of acquiring cards for specific units you want or getting a few extra credits. The amount you can request and donate across most player levels has been adjusted to be more consistent and provide more flexibility. We are making some balance changes to maps. All maps have been tuned for symmetric consistency of unit spawn points and automated harvester tiberium choices. We have made more significant changes to ten maps (listed below). The feedback and data around these maps revealed some patterns that we wanted to correct. From a game balance perspective we want maps to encourage certain army builds and strategies, but we want those builds and strategies to be different from map-to-map within a group of maps. No play style should be dominant on all maps to avoid optimal builds. The main issue we were seeing from this perspective was uneven distribution of maps that enabled harvester kill strategies. There was too much aggression in the Badlands map groups and not enough in the Alpine map groups. We’ve taken steps to correct that imbalance so that each group now has a more even mix of maps in regards to harvester harassment. The other issue we found was battle time, some maps (ahem, Center rally) were taking significantly longer to win or lose then others. These maps were too defensibly stable in their layouts, allowing players to stake out territory and making it hard for players to attack each other. We have taken steps to make these maps more volatile which should lead to shorter battles. We are keeping a close eye on how commander powers and long range units (MLRS, Artillery) are being used on each map, but aren’t making any specific changes with this update. The 2nd Tiberium field was moved away from the lower capture points to make it easier for players to attack two on one into ‘their’ capture point. This map had a bug, we’ve temporarily removed it. This map was taking too long and often getting to a state where all the tiberium was mined out. To encourage faster battle times we’ve moved the two capture points next to each other to allow for capture point to capture point fights and the ability to attack the harvesters in the top group of tiberium fields. This map put too much focus on the top capture point and caused too many harvester kills. To encourage more even engagement across the map we’ve removed some of the rocks to open a second path to the bottom capture points and moved tiberium fields to create more balance between the points. While this map is still dangerous for harvesters they shouldn’t be in as much danger as before. The arrangement of tiberium on this map was causing harvesters to go on long dangerous journeys across the capture points. The new arrangement reduces that behavior. Tiberium has been rearranged for harvester safety and to make better use of the entire map. Some movement blockers have been removed from the middle of the map to make it easier to attack when you don’t have control of it. Tiberium has been rearranged for harvester safety. Attacking both capture points has been made easier to reduce battle times for the map. This map has been redesigned for faster battles with more harvester aggression. Tiberium fields have been moved on this map to make attacking harvesters easier. Tiberium fields were moved to improve harvester pathing. Note: Battle minimaps have not yet been updated to reflect these changes. Note: In an undocumented change, the cost of Seth’s special ability was reduced from 80 to 60. We are not seeing too much in the way of game breaking balance issues so instead this week we are focusing on changes to improve underperforming units and making a few targeted tweaks to units and powers that are a little too good. Note: The Stealth Tank’s price and MLRS’ health remain the same despite the changelog. We decided to make some quick tweaks to promote some of the early game diversity we lost when making the Warfactory buffs. Most of those changes are left in place but we’ve reduced the effectiveness of the Rhino & Buggy to make Barracks openings more viable. This reduces the Rhino’s rate of fire and lowers it’s DPS. This reduces the Buggy’s rate of fire and lowers it’s DPS. These combine for a small reduction in Attack Bike DPS. We’ve been investigating map balance & bugs across the game and have made some initial quick fixes. We’ll be continuing our work on maps with an eye on making some larger changes in the future. Some maps have had their unit spawn points moved to create better gameplay. We examined Harvester automation and found that in some cases it was causing harvesters to move into dangerous situations (and in some cases it was outright broken). Harvesters look at the Tiberium fields as being part of a friendly group, a shared group or an enemy group. They will automatically mine friendly & shared groups. We’ve removed some fields from shared groups where it was getting Harvesters into trouble. When a Harvester runs out of valid Tiberium it will stop moving. You can manually send it into peril if you desire. Sectors 1, 2 and 3 now share the same pool of maps. This will increase early progression map variety. In Sectors 4+, players now have access to all 5 maps in each set. This will increase the variety of maps players experience across the game. You’ll now play on maps with 3 Missile Platforms more frequently than maps with 2 Missile Platforms. We think the 2-platform maps add nice texture to the game, but they were showing up too frequently and matches on them tend to run longer. This is a client-side update. Changes are unknown. Note: This update will include a client update that will impact old Battle Replays. After you update your client, all prior Battle Replays created before this patch can no longer be viewed. Also, we have not yet decided on changes for the Ion Cannon or Catalyst Missile, we are still monitoring them closely and are likely to make changes in the near future. Repair Drone received a general buff. Repair Drone now heal infantry for an additional 100 hp / second. Players are finding Orcas, and Orca openings pretty punishing and difficult to deal with. We have reduced it’s movement speed and reload time to help make it a bit easier to react to. We’ve also made some changes in other units to help them better counter Orca spam. This change will make it more likely for a Pitbull to survive an Orca volley. The good Doctor is a bit underutilized. We feel his heal rate is pretty strong but it’s probably a bit too expensive to want to take over say, Strongarm’s turret. Initial attack delay reduced to 0.1 seconds (was 1 second). These changes will make the Missile Squad much more reliable in terms of putting damage on high speed units like the Orca. Initial attack delay reduced to 0.1 seconds (was 0.5 seconds). We’re continuing to see the Cyborgs dominate the battlefield. This change will reduce their combat effectiveness but they’re still going to be pretty darn good. We will continue to monitor this guy closely. This will allow players to deal a little more damage to the Rockworm before it scurries away underground. 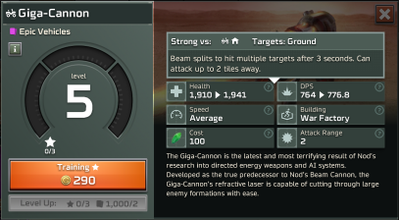 These changes will make the Laser Squad much more reliable in terms of putting damage on high speed units like the Orca. This should make the Venom a bit snappier and quicker to react to enemy threats. Attack separation delay reduced to 0.1 seconds (was 1.66 seconds). This will allow the Attack Bike squad to more quickly unleash a volley of rockets, which should promote and reward hit-and-run micro. As a side note: this idea came directly from the Rivals player community and we thought it so cool we wanted to test it right away. Thank you for your feedback and great suggestions! There is still plenty to do but we wanted to get some balance changes in your hands as quickly as possible so you’d have the ability to jam on them over the weekend. Your feedback has been invaluable in driving this first balance patch and you can expect to see plenty more changes in the future. Damage vs Infantry increased to 70 (was 65). The Rhino was given a slight damage increase primarily to help against Flame Troopers. Sandstorms, especially in pairs, are extremely efficient at killing enemy infantry due to their high rate of fire. This damage decrease versus infantry should make them much more vulnerable to being countered by Missile Squads and Laser Squads. The Zone Trooper cost increase is part of a more general tier 4 unit cost increase. Confessors are too efficient for cost, especially when paired up with Cyborgs. Cyborgs are arguably fine from a power standpoint but are far too easy to get out in large numbers late in the game. We will continue to monitor this guy closely. Damage vs Vehicles reduced to 15 (was 20). Flame Troopers are very good right now in general but specifically against light vehicles. This nerf is intended to make them more vulnerable to things like Rhinos without impacting their utility against enemy infantry and structures too much. We feel like the Flame Trooper’s power is contributing to the dominance of Cyborg / Confessor comps. We have made improvements to matchmaking that will help prevent high level players from matching with much lower level players. This may result in slightly longer wait times for players with high medal counts to find a match. Players are guaranteed 3 of each rare unit (Laser Troopers, Attack Bikes. We have made slight adjustments to card drop rates to get them more inline with our progression goals.